1. Why the Mosaici textbook? We wanted to create a challenging text that presents a wide and varied view of contemporary Italy, and develops intensive listening, speaking, reading and writing skills. 2. For what level of fluency would you recommend Mosaici? We tested Mosaici with students at different proficiency levels and find that it works best with learners in third year college courses of Italian. We also recommend it for high school AP courses and adult classes. 3. Would you use it for intermediate-high courses? Yes, definitely. Mosaici uses authentic material, so a more advanced group of students would work at a swifter pace, taking conversation and language activities to a more complex level. 4. What aspects of Italian contemporary life and culture does Mosaici illustrate? Mosaici is organized into six units: Traditions and Globalization, Young People and Employment, Youth Identity, The Elderly, The Environment, and Interpersonal Dynamics. We chose these subjects with a specific educational purpose in mind. Traditionally, first-and second-year textbooks introduce students to the language by summarizing the most significant cultural and social issues in Italian life: from family to city life to the arts, music, the school system, politics and sports, to mention a few. While this approach is initially useful, later in the learning process it becomes repetitive and can lead to oversimplifications. With Mosaici we let Italians from all walks of life talk about their experiences, which students can discuss, make connections to and compare to their own experiences. Additionally, the breadth of these topics allows students to do further independent research and present their findings at the end of the semester. 5. How does this approach help students move to a more advanced level? Mosaici's "antologia" approach -- which we believe can be more interesting culturally for students at this level -- is integrated by a rigorously structured method. Exercises on vocabulary, idiomatic expressions and grammar are always related to the context and topic being discussed, sometimes expanding on it, but always following a logical progression. This helps students improve their language skills while developing critical thinking. 6. How is each unit structured? Each unit is divided into three sections. The main topic is introduced by a scene from a contemporary Italian movie, with pre-listening and comprehension exercises, activities, and the viewing of the film clip. A short review of the grammar points found in the film dialog follows. The second section is an Antologia, with articles, statistics, games, and more. The third section, Vivavoce, introduces one or two videos, with pre-listening exercises, comprehension exercises and personal questions to encourage conversation. The film clips and the videos are included in the DVD. 7. Are the films and videos available to general audiences? The six films have been released and are available on DVDs, and some of the videos are available online on channels such as YouTube. However, as teachers we recognize how complicated it can be to show videos in a classroom: There are copyright issues to address, and sometimes videos are removed from YouTube. Also, finding the right scene on a DVD can be time-consuming. To facilitate the use of Mosaici we have obtained permission to reproduce the film clips and videos on a companion DVD. 8. How do you teach grammar with Mosaici? Our approach is a review of grammar based on the inductive method, encouraging students to observe, ponder and discover the use of grammar elements as they appear in the movie dialogues. The review of grammar is strictly related to language expressions in their context. We recommend that Mosaici be used with a good grammar text, determined by each instructor based on the proficiency level of the class. 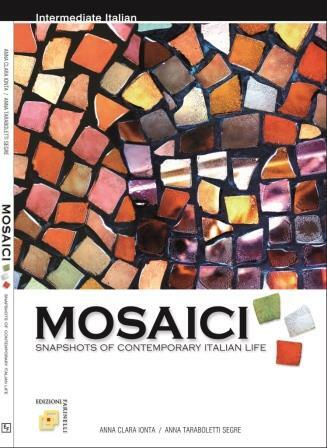 --Mosaici is a powerful, new, compact "all-in-one", 200-page, illustrated textbook with authentic letture. --Mosaici comes with a 60-minute DVD. 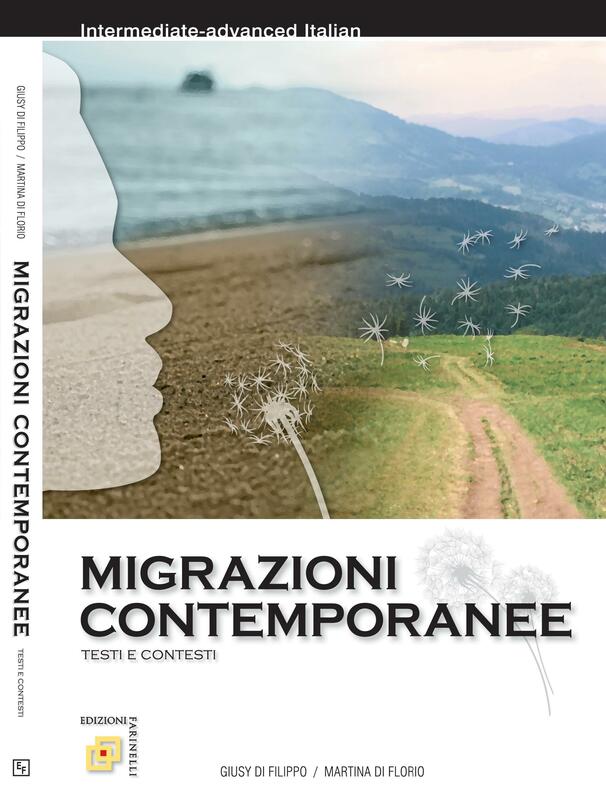 DVD includes clips from 6 contemporary Italian films (Focaccia Blues, Generazione 1000 Euro, Scrivilo sui muri, Pranzo di Ferragosto, La ragazza del lago, Giorni e nuvole), plus 11 videos on topics ranging from food to craftsmanship, to volunteerism, recycling and more. --Mosaici includes grammar reviews and a variety of stimulating exercises. --Mosaici incorporates tests at the end of each unit. --A separate Soluzioni/Teacher's Guide is available.